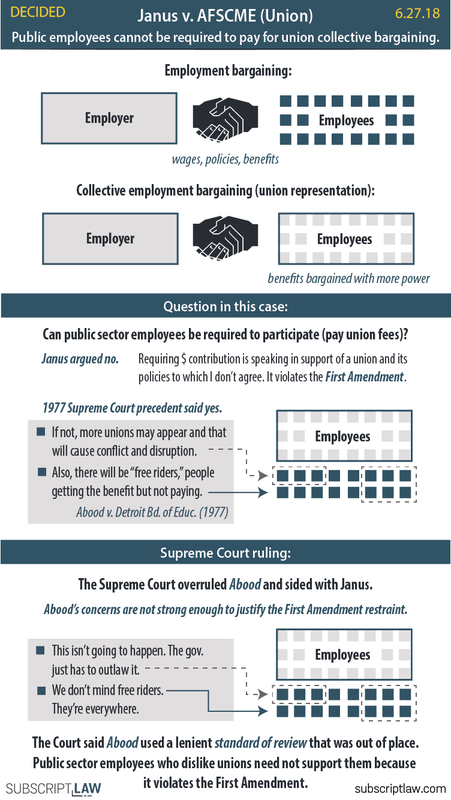 The Supreme Court ruled (Janus v. AFSCME) unions can no longer require fees from public sector employees who do not consent. States cannot require public sector employees to pay union fees. The Supreme Court reversed the 9th Circuit's decision in Trump v. Hawaii which halted Trump's controversial executive order on immigration (the "travel ban"). 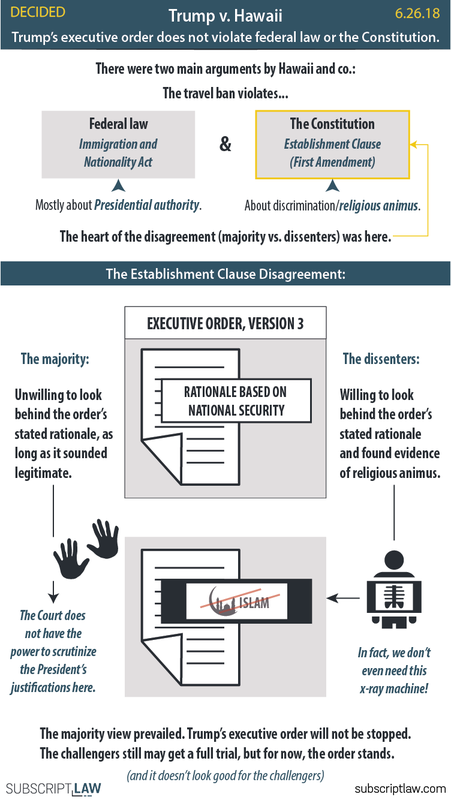 The Court ruled the most recent version of the executive order (3rd) is not likely to violate federal law or the constitution. Trumps’s third version of the travel ban is not likely to violate federal law or the Constitution. The 9th Circuit’s decision halting the order is reversed. The California notice requirements affecting women’s health clinics are likely to violate the First Amendment. Only one of the Texas voting districts is an impermissible racial gerrymander. The Sherman Act does not prohibit the Amex contract with the merchants because Ohio et al. have not shown anticompetitive effects on cardholders. Today the Supreme Court ruled in Carpenter v. U.S. that the government will face a higher bar to get access to your cell phone location data. It will need to show probable cause in its need for the records (the 4th Amendment standard) instead of the lower bar under the Stored Communications Act. The government needs a 4th Amendment warrant (probable cause) to get your cell phone location data. Double Jeopardy (5th Amendment) does not prohibit the second trial against Currier because Currier agreed split his case into two trials. WesternGeco can get damages for the profits it lost abroad as a result of ION’s infringement of its patent. The Supreme Court clarifies jurisdiction and judgeship in the court martial system. The Supreme Court overturned major precedent today in ruling for South Dakota in South Dakota v. Wayfair. Before today's ruling, states could only collect tax on online sales if the seller had a physical presence in the state, but now the Court said an extensive virtual presence is sufficient. Field day for states ahead! Don't worry - Amazon already collects for state taxes, so you won't see cost increases on those orders. A state can collect tax on online sales even if the seller does not have a physical presence in the state. An extensive virtual presence is enough. SEC judges must be formally appointed because they have significant authority. Railroad employees will not get taxed on stock compensation. A notice to appear under the deportation rule must include time and place. Pereira’s notice was inadequate and thus did not end his period of living continuously in the U.S. 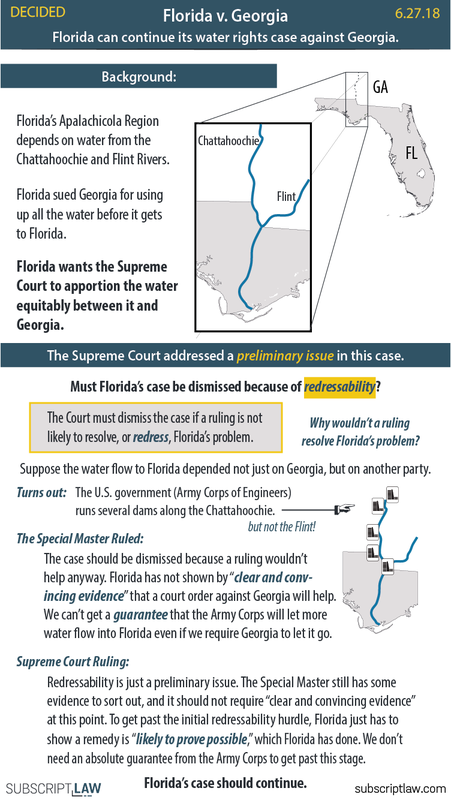 The Supreme Court did not resolve how it will handle political gerrymandering cases. It decided Gill v. Whitford and Benisek v. Lamone on alternative grounds. Perhaps a future case will prompt the response court-followers were hoping for. 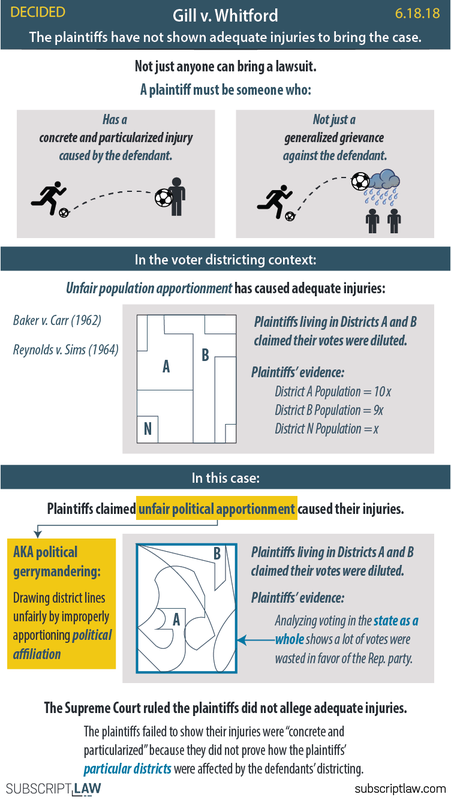 The plaintiffs did not show adequate injuries to bring the political gerrymandering case. The denial of preliminary relief on the political gerrymandering claim stands. Lozman still has a retaliatory arrest claim against the City, despite that there was probable cause for his arrest. 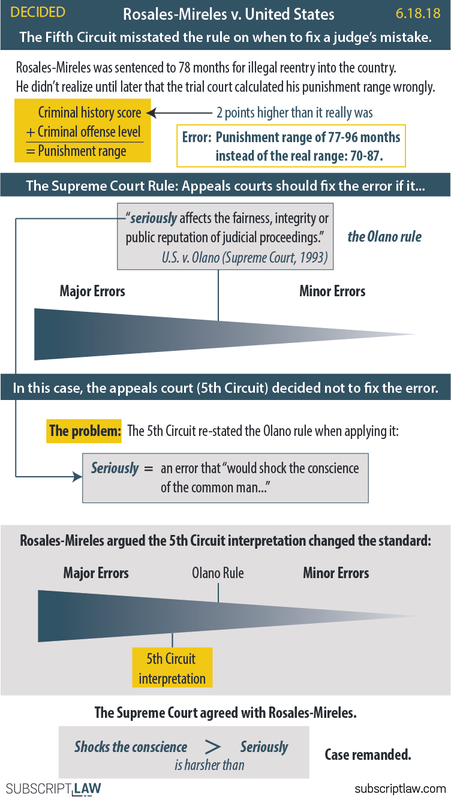 The Fifth Circuit used the wrong standard in deciding when to fix a judge’s mistake. It must reconsider Rosales-Mireles’ case. The lower court justified itself sufficiently in making the sentence adjustment. Minnesota’s ban on political apparel violates the Free Speech Clause of the First Amendment. The court was not required to defer to the Chinese government’s brief in interpreting Chinese law. Ohio’s voter roll purging process does not violate federal law. Resh’s class action was not filed on time because the claim is not entitled to the time extension. The Minnesota law can apply retroactively, so Sveen’s kids will get the life insurance proceeds. This last sneaky fellow won't get an updated infographic because it was affirmed without an opinion. Result: the Court affirmed the lower court ruling by default (through a 4-4 tie). The result leaves the lower court decision in place, which is a ruling in favor of the U.S. (i.e. the Indian tribes). Justice Kennedy did not participate in the case because he had participated in an earlier part of the case (on the 9th Circuit Court of Appeals). 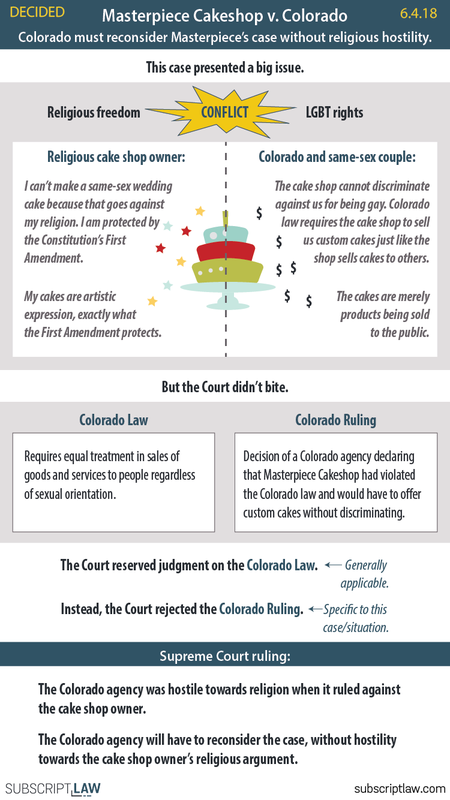 Colorado must reconsider Masterpiece Cakeshop’s case because its original ruling expressed hostility towards religion, violating the First Amendment. Appling can get the law firm debt discharged in bankruptcy because his oral statement was not fraudulent. Hughes v. U.S. & Koons v. U.S. 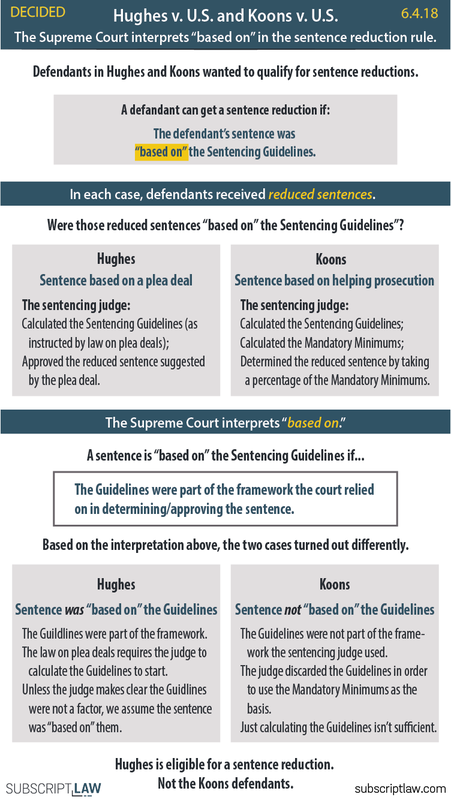 The Supreme Court interprets “based on” in the sentence reduction rule. A parked auto in a driveway is part of a house. Police need a warrant to search it. The Supreme Court interpreted the victims compensation law narrowly, ruling for Lagos. Employees can sign away their rights to bring class actions against their employers. The case returns to the lower court to consider a new question. States can legalize sports betting. The federal law prohibiting it is unconstitutional. The lawyer cannot overrule a client's choice to plead innocent. A person can have 4th Amendment privacy against police search when driving a rental car, even if the person is not listed on the car lease. The case became “moot” when the challengers no longer faced pre-conviction shackling. The wiretap order was not “facially insufficient,” so Dahda cannot get the communications suppressed. Patent rights can be reviewed in executive branch courts. If the Patent Review Board starts a patent review, it must address all of the patent challenger’s claims. Foreign corporations can’t be sued under the Alien Tort Statute. Dimaya cannot be deported based on the INA's definition of "crime of violence" because the definition is too vague. 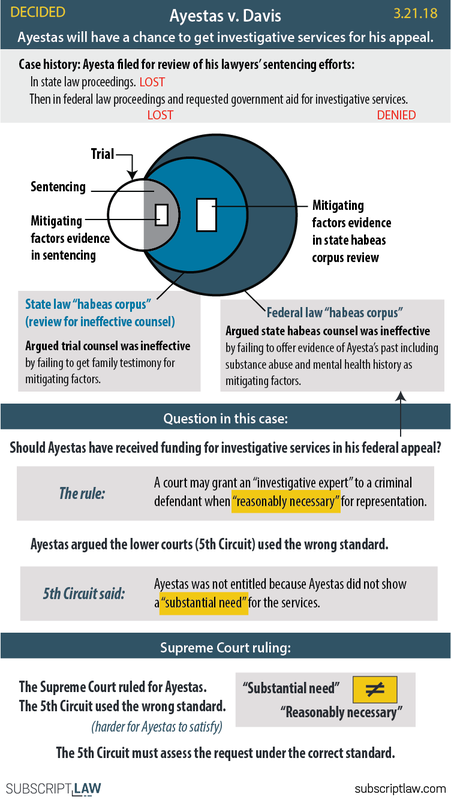 A federal habeas reviewing court should "look through" an unreasoned state court decision to find the rationale. On April 17, 2018 the Court dismissed U.S. v. Microsoft as moot. 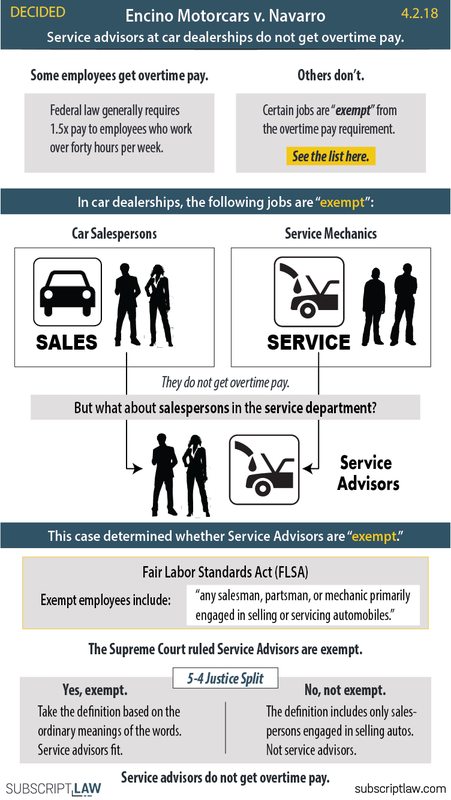 Service advisors at car dealerships do not get overtime pay. The Court issued a summary decision in this case, which means it ruled without hearing arguments. Kisela is not liable for excessive use of force because he did not violate clearly established law. Two cases can be untied ("unconsolidated") so that one can be appealed before the other is final. Ayestas will get another chance to argue he should get investigative services for his death penalty appeal. General tax evasion does not make you liable for the felony obstruction charge. Marinello wins. The Supreme Court ruled the retirement fund's class action can continue in state court, even though it's based on federal law. The United States can intervene in the water dispute between Texas, New Mexico and Colorado even though the United States was not a party to the Rio Grande Compact. 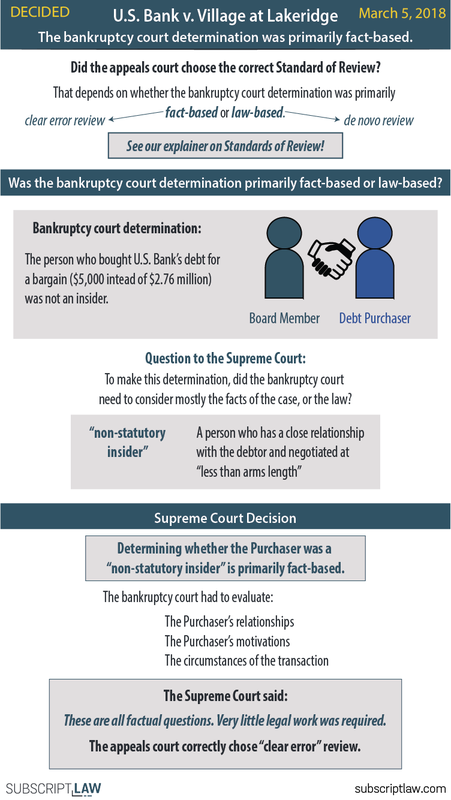 The appeals court correctly chose to review the bankruptcy court determination for clear error instead of de novo review. The determination was primarily fact-based. The Supreme Court will not use "Constitutional Avoidance" to imply that noncitizen detainees have the right to bond hearings after being held for a certain amount of time. Merit Management cannot take advantage of the bankruptcy safe harbor provision. That provision is meant for transfers to brokers. 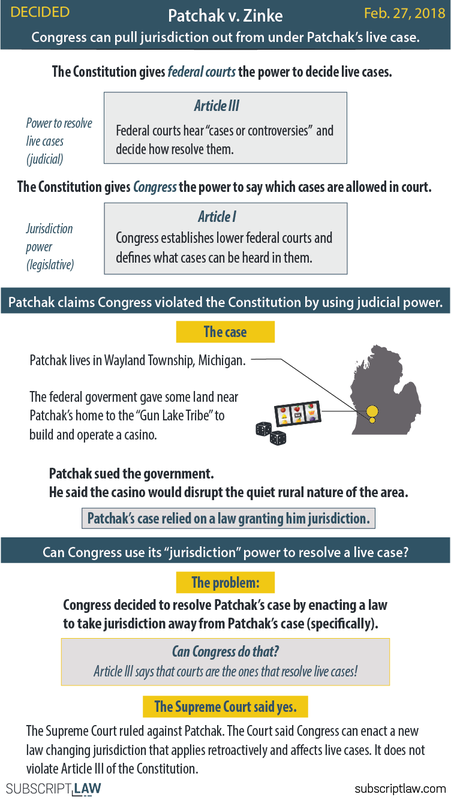 The Supreme Court ruled Congress can use its jurisdiction power to affect live cases. It does not violate the Constitution for encroaching on the judicial power. Class can proceed with his constitutional claims despite that he originally pled guilty. 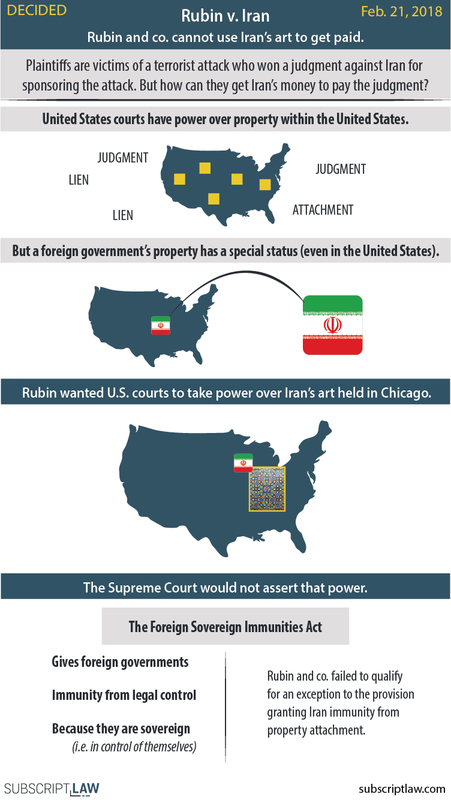 Rubin and co. cannot use Iran's art (held in Chicago) to collect on their $71.5 million judgment. Murphy was awarded over $300,000 for abuse he suffered while in prison. The Supreme Court ruled Murphy must use 25% of his award to pay his attorney's fees. Somers cannot get whistleblower protection under Dodd-Frank because he did not report to the SEC. Retirement benefits aren't necessarily for life. The police officers had probable cause to arrest the D.C. partygoers, and they would have had immunity too. 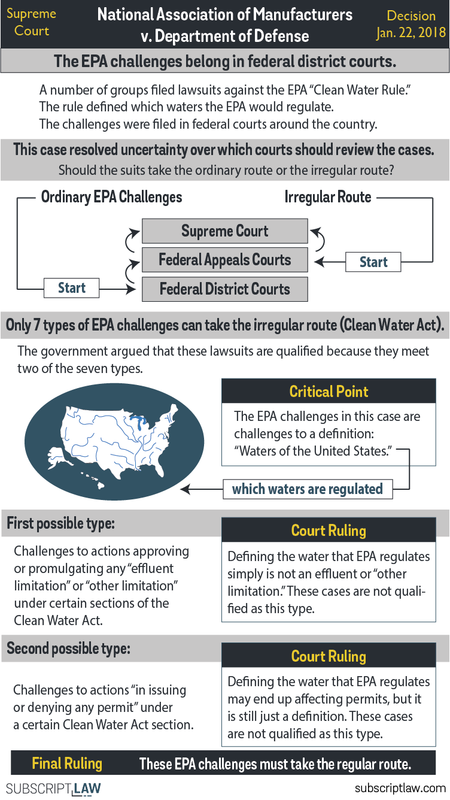 The EPA challenges must start in federal district courts, despite federal government arguments that they should go directly to appeals courts. The filing deadline, which says to "toll" the remainder of a filing deadline, will save that time. Artis wins because she filed within the time allowed by the rule. The Supreme Court can decide on a case without hearing oral arguments and without even asking for briefing from the parties. The Court issued a "summary decision" on January 8, 2018, over a dissent from three Justices (Thomas, Alito and Gorsuch). In 1991 Keith Tharpe was sentenced to death for murdering his sister-in-law. Years later, Tharpe's attorneys got an affidavit from one of the jurors indicating the juror had significant racial bias (e.g. the juror "wondered if black people even have souls."). A state court would not review the affidavit as evidence of racial bias, and neither would a federal district court. The federal appeals court also would not consider the evidence. The Supreme Court reversed. It said the affidavit purporting to show racial bias should have been considered as evidence in the federal court case. Although the federal court may only overturn the refusal to consider the affidavit if there is "clear and convincing evidence" that refusing it was wrong, the Supreme Court found the affidavit was remarkable enough that it might have met that standard. 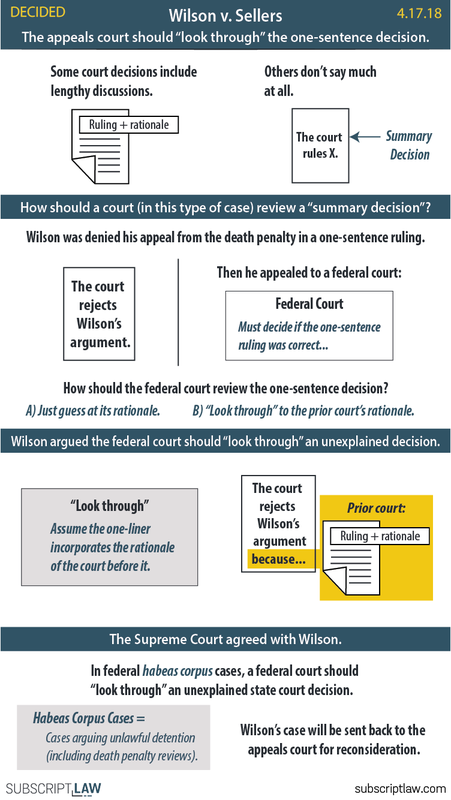 The lower federal courts must consider the affidavit, although the Supreme Court notes that relief for Thorpe from the death penalty is still a long shot. The appeals court had dismissed Charmaine Hamer's appeal because it said the court was strictly bound by a filing deadline rule. The Supreme Court decided the rule is not a "jurisdictional" rule, so the court can work around it if necessary. Hamer wins. The Supreme Court can decide on a case without hearing oral arguments and without even asking for briefing from the parties. The Court issued two unanimous "summary decisions" on November 6, 2017. Over 30 years ago, Madison was convicted of shooting a police officer in the back of the head twice. He was sentenced to death. More recently, he suffered several strokes and in 2016 he challenged his death sentence on the basis of mental incapacity. The situation as presented to the Court was: Madison did not have memory of shooting the police officer. However he did understand that he is facing the death penalty as retribution for the crime. The lower court (federal appeals court) ruled that Madison's lack of memory of the event means he is not competent to receive the punishment. The Supreme Court disagreed. The Court said memory of the event is not essential. As long as he "rationally comprehend[s] crime and punishment," as the case here, he can be executed. Supreme Court precedent just requires that he understand the retributive purpose of his punishment. Cuero pled guilty to two felonies alleging he drove his truck into someone while on meth without a license and carrying a gun. The maximum punishment was just over 14 years. After the court accepted his plea, the prosecution realized it made a mistake: the prosecution didn't list one of Cuero's prior convictions that would turn his case into one with a minimum of 25 years. The court allowed the prosecution to add the prior conviction. Cuero (now facing a much longer punishment) was offered to withdraw his guilty plea and start over. He ended up pleading guilty again and got 25 years to life. Cuero challenged the sentence, arguing the prosecution could not take away the original the 14-year deal. The lower court (federal appeals court) sided with Cuero, saying the prosecution broke a contract by taking away the original deal. It also said failure to honor the contract violated "clearly established Federal Law" as determined by the Supreme Court of the United States. The Supreme Court got into this case to say: no, no. It's not a violation of federal law as determined by us, the Supreme Court. Offering Cuero to withdraw his plea and to start from scratch is acceptable under Supreme Court precedent.